If you want to learn more about cement tiles or are considering them for a project, Avente has a new recommendation for a great new read: Cement Tile: Evolution of an art form. Photos of installations and designs are peppered throughout the book and will provide ideas for your project. The books celebrates the 60th anniversary of the Aguayo Tile Factory in the Dominican Republic. A strong business that is still family-owned and dedicated to the same values of quality. The book provides a complete history of this fascinating and durable product: cement tile. The book is available for purchase at amazon.com. Browse our catalog or purchase Cuban Heritage Cement Tiles from Avente. 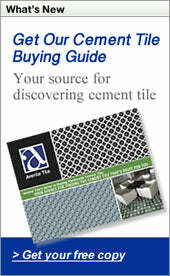 See Avente's Cement Tile Installation Guide for further details. Or, watch a slide show of all the Cuban Heritage Cement Tile Designs. What's hot for 2010? According to Pantone, Turquoise is the color of the year. We agree, it is a great color. It has appeal to both men and women and a color that most folks find appealing and respond to positively. Turquoise is an inviting, luminous hue, and is a combination of blue and of green. It conjures images of a peaceful tropical lagoon and provides a great escape from the everyday world. According to Pantone, "Turquoise pairs nicely with any other color in the spectrum. Turquoise adds a splash of excitement to neutrals and browns, complements reds and pinks, creates a classic maritime look with deep blues, livens up all other greens, and is especially trend-setting with yellow-greens." Don't be left behind, left Avente help you translate this great color to an interior tile solution for you!